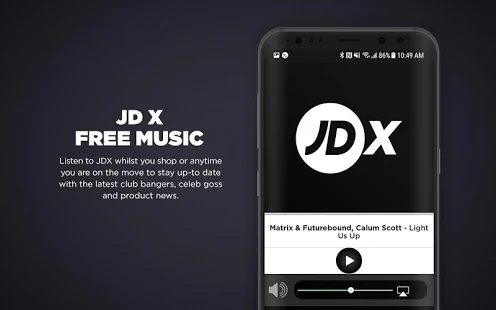 Multichannel instore and digital production company Immedia is working with JD Sports (JD), the leading UK trainer and sports fashion retailer, to create a new multi-stream music entertainment platform, JD-X, available to customers instore and via its mobile app JD Sports. JD-X is a 24-hour music and entertainment service which officially launched this weekend at a VIP party, with an exclusive live performance by Anne-Marie, and is part of a larger programme of added benefits designed to enhance the experience of JD consumers. Including, unlimited next day delivery, priority access to exclusive events, early product launch access and other money-can’t–buy-experiences. The music and entertainment platform is currently being rolled out to all JD UK stores. Immedia provides language specific channels on a global basis and there are plans for the JD-X platform to be available in other European countries including in Ireland, France, Belgium, Spain, Portugal, Germany, Italy, Netherlands, Sweden, Denmark and Finland. JD-X offers a main Live channel featuring DJ’s, guest artists and other exclusive and relevant content, plus 20 other bespoke streams with specific playlists to cover genres and trends. The JD-X Live channel focuses on the biggest tracks popular with the JD audience. Core artists include Drake, Ramz, Mabel, Stormzy, Anne-Marie, Calvin Harris, J Hus, Dua Lipa, Post Malone and Kendrick Lamar. The 21 channels focus on genres and activities popular with the JD audience, such as UK Reppin’ – featuring tracks from the stars of the UK Grime and RnB scenes. There are other playlists to listen to when in the gym or out running. JD-X also provides content relevant to consumer interests including sport, clubs, gaming, gigs, relaxation, and TV. JD-X also features videos, for example the latest content from JD including celebrity exclusives and features on new products, all available to view inside the app. The JD-X entertainment platform was delivered by Immedia’s DreamStream X technology, a global platform which enables brands to launch and develop custom music and entertainment channels, amplifying cultural values and other interactive communications. Immedia’s exclusive high-quality content streaming platform provides brands with the opportunity to take owned media channels and to convert them into entertainment and engagement channels that can deliver increased commercial return.